With so much recent news of natural disasters around the world we decided to follow up yesterday’s post to Facebook reaching out to the folks affected by the storms and tornadoes in the South with this blog post. At The Shade Store, we value the way design can make change, and we want to recognize a great organization that works locally and globally to make a difference in people’s lives around the world. Supported almost entirely by individual donations from generous supporters, Project H Design is a nonprofit organization that supports, creates and delivers humanitarian and life-improving product design solutions. Its creator, Emily Pilloton set forth a mission to show that product design through philanthropy can bring benefits to underserved communities in need. In 2009, they produced a book entitled, Design Revolution: 100 Products That Empower People, published by Metropolis Books. 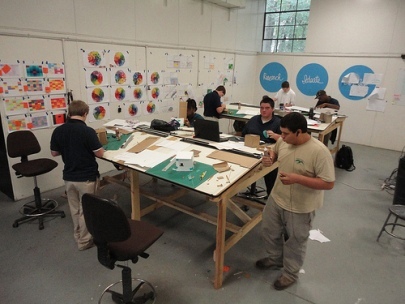 And, in the past year, Project H’s focus has been re-thinking environments, products, experiences, and curricula for K-12 education institutions in the US, including a design/build high school program in the Bertie County School District, North Carolina. Yes, that’s right – Emily and her partner, Matt Miller, are now a high school teachers – the program is called Studio H.
As you may know, Bertie County was one of the areas hardest hit by Saturday’s tornadoes—talk about facing the organization’s challenges front and center. They couldn’t be more “in it.” Within hours of the storm’s passing Project H put out a call to raise money. And they met their first goal to raise $5,000 to fund ten “basic needs” grants for families of their students. Yesterday, they raised the goal to $7,500 to fund five more grants, and quickly surpassed it. A great effort, wouldn’t you say? To learn more about Project H Design, we’re going to link you to a great and inspiring video of Emily Pilloton’s TED talk from last November. View it here. To help further their most recent efforts for the Bertie County community, you can donate here. To show your support to Project H Design’s efforts as a whole, visit their web site: http://projecthdesign.org/. We agree that design really can help change the world.